Information is mainly derived from those published by Current Archaeology with others added. The opportunities vary in type, dates, duration, cost and eligibility. It is essential that any interested parties research the sites fully before committing to attending. External links have been reviewed, however the ARA is not responsible for the content of external websites and we do not link to external sites in return for cash, services or any other consideration in kind. Temple of Mithras Oral History Project: Bloomberg and MOLA (Museum of London Archaeology). 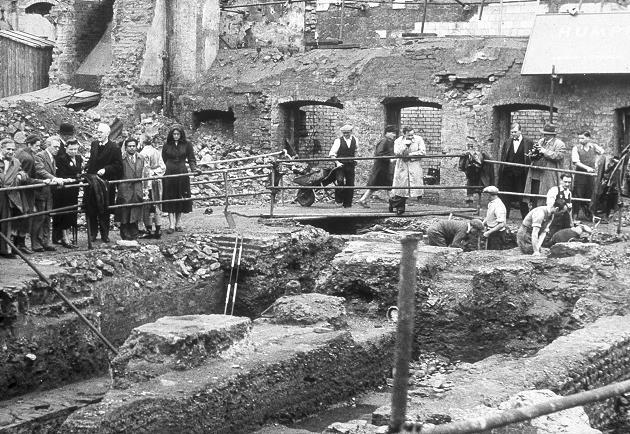 MOLA (Museum of London Archaeology), in conjunction with Bloomberg, are undertaking an oral history project collecting the remembrances of anyone who visited the original discovery of the Temple of Mithras back in 1954. Some of you may have heard about this on the Today programme on Radio 4 this morning or on the lunchtime BBC news. If you visited the site, or know someone who did, have any cuttings or photographs, or even just remember queuing for hours, they would love to hear from you. The telephone line is manned from 9.00 to 5.00 but there is an answer machine attached and everyone who leaves their details will be contacted. Westminster Comes to St Mary's, Little Brickhill. David S. Neal. St Mary Magdalene : Watling Street, Little Brickhill, Buckinghamshire, MK17 9NA. 26-27th July, 2-6pm. 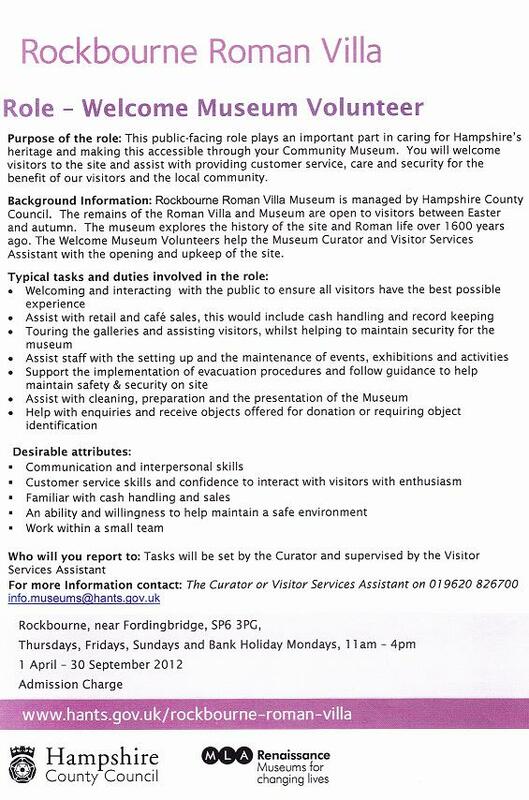 Rockbourne Roman Villa near Fordingbridge in Hampshire (postcode SP6 3PG) is to open again in 2012 on Thursdays, Fridays, Sundays and Bank Holiday Mondays, 11am to 4pm, 1st April to 30th September. The villa is the largest in the area and has evidence of 40 rooms with surviving bath houses, living quarters with mosaics and hypocausts, farm buildings and workshops. This important Roman heritage site was in danger of being closed to the public but thankfully remains open. Volunteer Museum Welcomers are needed to help with the running of the site, shop, museum and displays to ensure that the site stays open. As part of the Association's remit for the promotion, presentation and preservation of Britain's Roman Heritage we happily encourage people to help. If you live within reasonable distance and can spare a little of your time and help in this fine commitment it would be gratefully received and could also promote the wider awareness of the Association for Roman Archaeology. In 1959 excavations directed by the late Charles Daniels, east of the great minster church at Southwell in Nottinghamshire, revealed evidence for a Romano-British rural building, interpreted at the time as a substantial villa of importance. The work was done in advance of a proposal to construct a school on the site. 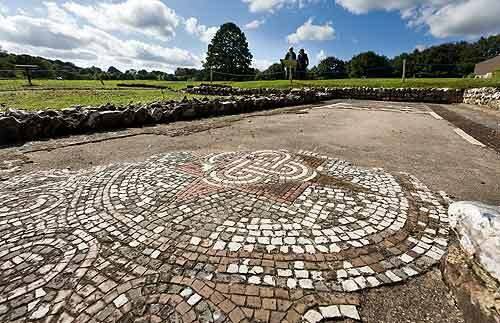 Romano-British remain, including tessellated flooring, had been revealed intermittently across the area since the late 18th century. The present Norman minster was preceded by an earlier Saxon church on the site. Evidence of this has been postulated from a section of tessellated floor thought to be constructed from salvaged material from the adjacent villa and re-laid in the Saxon period. However an alternative interpretation, that this segment of floor is of original in situ Roman date, comes from Bryn Walters' examination of the remains. The floor respects the alignment of the Minster's transept walls, which may suggest that a minor detached Roman structure, associated with the villa, was utilised as part of the first-phase Minster. In 1971 when the school was under construction over 200 burials were disturbed in an area subsequently identified as the lower courtyard of the Roman villa. Unfortunately no confirmed dates were obtained for the burials. The school was demolished over 10 years ago when it was proposed that the site be used for a housing development. The most recent archaeological evaluation trenches (2008-09) on the proposed development site revealed substantial stone walling, not previously detected. The walls, constructed in massive blocks of masonry may have formed part of a monumental structure or massive terracing for the suggested villa. Dr Phil Dixon, Archaeological Advisor for the Minster, supervised repair works beneath the Minster's chapter house several years ago and encountered the source of a prolific spring. This spring would have risen on the higher ground just west of the main villa building and a little way north-east of the south transept where the tessellated floor is seen. The combination of this evidence has supported the theory put forward by Bryn Walters, that the Southwell villa, certainly in the fourth century had been part of a spring-line sanctuary with a possible temple or shrine on the higher ground above. Comparative sites with similar interpretations include Great Witcombe and Chedworth, both in Gloucestershire. The importance of Southwell lies in its continuity; its transition from pagan site into a Christian one, a site that did not fade away with time but continued as a sacred site, serving a living community up to the present day, and may be unique in this respect in Britain. Last year, in 2011, a planning application was refused for development of the site but others may be forthcoming in the future. Campaigners intend to submit a formal application for a change of use for the area, so that it may be preserved and landscaped as part of a Southwell Heritage Park. This may allow more detailed archaeological study and preservation to take place. The campaign support includes that of Bryn Walters on behalf of the ARA, Professor Martin Henig, Dr Will Bowden of Nottingham University, and others from within the archaeological community. Anyone wishing to offer support for this valuable site should write to: Chief Planning Officer, Newark and Sherwood District Council, Kelham Hall, Newark, Nottinghamshire, NG23 5QX and also send a copy to: Southwell Heritage Park Campaign, 15 Kirklington Road, Southwell, NG25 0AR.